King Richard II (1367-1400), son of Edward the Black Prince, was crowned at age ten, with the regency of a council headed by John of Gaunt. His achievements when an adolescent in negotiating an end to the Peasants' Rebellion, 1381, were not lived up to when he ruled the country as king. He alienated Parliament, was deposed in 1399 and died (probably murdered) a prisoner at Pontefract Castle. This collection of historical documents, a chronicle of English kings and rules for activities at the royal court was made during Richard's reign. It is possible that the king had it made for his ally, Thomas de Mowbray. Its miniatures resemble closely others surviving in manuscripts decorated for the monks of Westminster Abbey as well as a few linked to Richard II, who apparently was an outstanding royal patron of painters. The Wilton Diptych (in the National Gallery, London), probably his personal devotional shrine, represents him before English royal saints adoring the Virgin and Child. Richard II's grandfather, Edward III, granted Aquitaine to his father, Edward the Black Prince. The document is copied on this page, its beginning letter embellished with a picture of the event. The Black Prince kneels to receive the grant from the enthroned king. 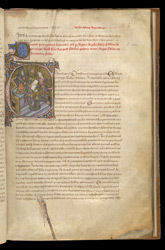 The treaties copied in this manuscript attempt to affirm the failing reign of Richard II, via the exploits of his Plantagenet forebears, in the face of growing failure to cope with the tremendous social and political upheavals of the late 14th century.